The digital marketing landscape is dynamic and ever-evolving. Every day is a new ball game. As a CMO, you need to try to uncover new strategies to spread the word about your brand. With new strategies, you’ll be able to reach more people and even engage your current customers more effectively. To be ahead of your competition, you need to be able to innovate and come up with new approaches. If you don’t innovate, you’ll be left behind. Recently, influencer marketing has started becoming fairly popular among digital marketers. In fact, Google Search Trends show that influencer marketing has outpaced print marketing. With such staggering growth, it is important for you to know what influencer marketing is and how it can help you. It is a method of marketing in which you can leverage the audience of an influencer to market your brand. An influencer is a person who has a significant influence on a large number of people. It essentially uses influential individuals to spread your brand’s name and message to others. The best part about influencer marketing is that you can reach a highly targeted audience. Additionally, it gives your marketing campaigns a more human touch through the influencers. Influencers are not necessarily celebrities. They are also people who have a huge fan following on social media and blogs. There are also influencers who do not have such a huge fan base but are still influential within their circle. And they are called micro-influencers. Micro-influencers ideally have between 10,000 and 50,000 followers depending on their niche. They usually have a close-knit circle of followers who trust them a lot. They have high engagement rates as well. This makes them great for influencer marketing too. On the other hand, large influencers have a fan following that goes into millions. 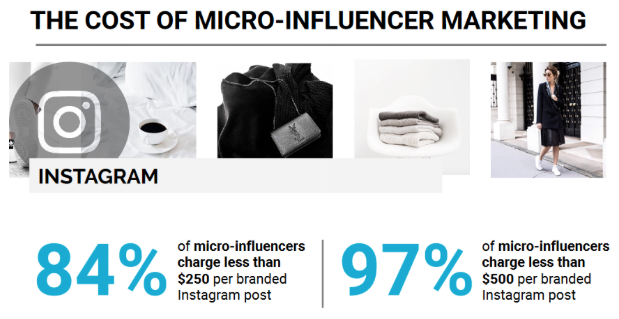 While they have lower engagement rate than the micro-influencers, their reach is massive. With them, you can get your brand in front of a huge audience. For example, Andreea Cristina is an influencer who has millions of followers. She frequently creates content in the beauty niche. So a beauty brand partnering with her could easily reach a million people. But it’s not just the reach factor that makes influencer marketing so appealing. It’s the power these influencers have over people’s purchase decisions. According to Collective Bias, 30% of consumers are likely to purchase a product that’s recommended by a non-celebrity influencer. While only 3% of survey respondents said that they are influenced by celebrity influencers. This clearly proves the power of influencer marketing. There are three very important Rs that you need to keep in mind in influencer marketing. These should especially be kept in mind when selecting your influencers. They are relevance, reach, and resonance. Whenever you’re looking for an influencer, you need to determine their relevance to your brand and niche. You need to carefully look through their content and see whether they are continuously talking about topics related to your niche. You should also check their tone, aesthetics, and the style of their content. It should be in-line with the message that you want to deliver to your target audience, and should match your brand’s personality. You also need to look at the number of followers that the influencer has. This doesn’t necessarily have to be based on just one platform. You can look at the sum of their followers across all social media platforms. You should take an influencer’s likes, shares, and comments into account to get an idea of their engagement. This is the number of people who are interacting with their posts. It’s only when people interact with the posts that they will notice your brand. The engagement rate is essentially this number divided by their total followers. This percentage shows you the percent of their followers who are interacting with your brand-related influencer content. The higher the engagement rate, the better it is for you. Based on these three factors, you can search for influencers to promote your brand. Searching for influencers is not an easy task. You need to first zero in on the platform on which you want to promote your brand. After that, you can start finding people who are posting in your niche on that platform. For this, you’ll need to search for relevant hashtags and keep track of who’s using them regularly. You’ll easily be able to see those who are posting consistently and are ranking high for those hashtags. You can then go check out their profiles to see their content. If the content is in-line with what you’re looking for, you can start reaching out to them. However, there are some influencers out there who have fake followers and likes. If you fall into their trap, you could end up wasting money on people who cannot deliver. To avoid this, you need to carefully vet your influencers. While finding influencers is a task in itself, staying away from fake ones is a bigger challenge. You need to take care and follow the influencer’s posts carefully. You should see how much engagement their posts have. Based on this, you can decide if the influencer is genuine or not. The platform provides you with their verified contact information so you can easily get in touch with the best influencers for your campaign. You can even pay influencers, send them products, and monitor their progress using the platform. This can make influencer marketing easy for you. These are the posts that influencers create to showcase your brand to their audience. Only one brand is featured in these posts, giving your brand their complete focus. This ensures that their followers notice you. Sponsored posts can be centered around spreading the word about your brand. You could even use them for lead generation. All you need to do is get them to add a short link to your landing page in the post. This type of post can even be used to sell your products. This can be done by simply placing a link to your product page in the post or in the influencer’s bio. However, it is difficult to trace the ROI of influencer marketing campaigns. A study by Linqia said that 76% of marketers felt that determining the ROI is influencer marketing’s biggest challenge. However, with tools like Grin,* you can easily determine the ROI of the campaign. All the information is available on the portal for your ease! You can even pay the influencers their fees, send them their products and track the entire campaign. This makes it easy for you to handle your influencer marketing campaign. This is the price you have to pay an influencer for creating a post. It doesn’t necessarily have to be in monetary terms. You could offer them high-end products at a discounted rate, give them a shoutout, and so on. The fee could depend on the product that you give to the influencer to review. For instance, the influencer may charge less to review a high-end product. It also depends on the amount of work that goes into creating the post. The influencer may charge you more to create a detailed video, but a simple photo featuring the product may not cost as much. It also depends on the audience that the influencer has. The larger their fan base, the higher their charges will be. When you’re collaborating with an influencer, you need to create an agreement with them. This is done so that the requirements and terms of the agreement are clear to both parties. This legally binds both the parties to honor the terms of the agreement. This will help ensure that the execution of your influencer marketing campaign goes smoothly. Influencer agreements have no particular format. They can be tailored based on your unique requirements and the terms discussed between both parties. This agreement should describe, in detail, the number of posts to be created, the amount to be paid, the duration, and more. This is yet another agreement that should be made between the brand and the influencer. It details that the images taken by the influencer can be used by the brand. You can repurpose them however you deem fit. It can be a separate agreement, or it can be a part of your campaign agreement. It helps enhance the relationship with your influencers as well. This is because you will be promoting the images on your social channels too. These images help showcase the influencer’s review as a testimonial. When your audience sees the influencer advocating your brand, they will trust you even more. If you want to pay the influencer as an affiliate, you can generate an affiliate link for them. Whenever the influencer’s audience clicks on this link and makes a purchase, the influencer will get a commission. The affiliate link is a unique link that is provided to each influencer. It makes it easy for you to track the sales that each influencer has generated for you. As the influencer makes money off each sale, they will be more motivated to help increase your sales too. Influencer marketing is a promising field in marketing that many brands are using. With high returns and relatively low investments, brands are able to effectively market their products and services. You can not only improve your reach but can even generate leads and sales for your brand through influencer marketing. We hope this guide sums up all of the basics you need to know about influencer marketing. If you have any questions, let us know in the comments section below. We’ll try our very best to answer them for you.